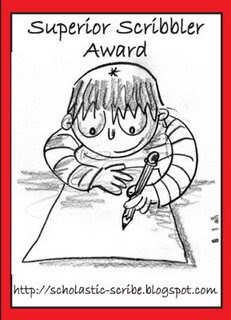 I received the Superior Scribbler Award from my new blog pal Revvy Rev over at A Certain Sound. I am both humbled and honored to be the recipient, thanks Rev! 4. Each Blogger who wins The Superior Scribbler Award must visit This Post and add his/her name to the Mr. Linky List. That way, we'll be able to keep up-to-date on everyone who receives This Prestigious Honor! 5. Each Superior Scribbler must post these rules on his/her blog. I am passing the Superior Scribbler Award to the following diverse five who have inspired me through their unique insights, providing me with a more diverse perspective. Y'all keep up the good work! Malcolm @ Pop Culture Dish for his unique spin on all things pop cultural. Marvalus @ The Marvalus View for helping to make every Friday special. X. Dell @ The X Spot for digging deep to help make sense of past conspiracies. Lori @ Lori's Old School Mix who better to give the award to than a world class writer. Thembi @ What Would Thembi Do? for being thought-provoking and just plain fun to read. Aww shucks, another award?! (LOL) Thanks PJazzy. You know I hate following rules, so I'll make no promises (smile). Aw shucks, Pjazzy, you shouldn't've. I do say that you definitely deserve the ard, so congratulations. I've been looking forward to your posts ever since you've been on the air. Congrats Pjazzy and thanks for passing it on to me. I'll do a post later this week. Congrats! Congrats! Congrats! You deserve it! Sorry for being on such CP Time...thanks SO much for the recognition! Old School Friday: Stevie Wonder Tribute! Obama's Views On Sagging Pants. Wanda Sykes Is Gay, You Got A Problem With That? Old School Fridays - Thank God It's Over!